Like dissolves like, what dissolves in what, which aqueous solutions are electrolytes? All of these follow fairly easy, repetitive patterns, but students need lots of repetition to practice the skills involved in making these decisions. 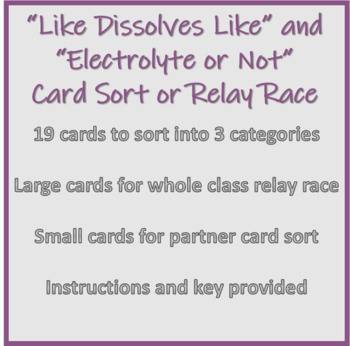 There are two ways to use this card sort – as a partner challenge (the smaller cards) or as a class relay race (the larger cards). This should be used after introductory lessons on how polarity affects solubility and electrolytes versus nonelectrolytes. In my class, we practice examples of a few of these ahead of time, and go over the main patterns, and then the goal is to see if they can apply these patterns to the rest of the cards. 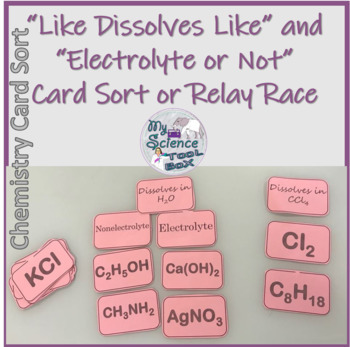 This card sort challenges the students to think through two concepts at the same time – which solvent will it dissolve in, and then, if it dissolves in water, is it an electrolyte or not? This is a great alternative to a worksheet to give students repetitive practice in a fun, competitive way.